The following definitions are provided to assist you in understanding some of the commercial property nomenclature Brokers and Landlords use in Arizona. If you don't see it here, feel free to call or text us 602-618-8615 and we will quickly give you our interpretation. These are not legal interpretations and should not be relied upon. Many larger buildings will charge a tenant for excess air conditioning cooling usage if they are working in their space beyond normal business hours. If you plan on working in your space 24/7, this could be expensive. Anywhere from $8 to $40 per hour for each hour beyond the normal. Federal regulations intended to equalize access for people with disabilities in buildings. New buildings must comply in order to obtain their building permits. Lease spaces being substantially remodeled need to comply in order to obtain permits. Older buildings not being remodeled have not normally been required to change. Changes can include wider restroom stalls, ramps, hand-rails. Lease language provision in which the tenant agrees, in advance, to accept or pay rent to a new landlord or new owner. This is important if the current landlord defaults on their mortgage or the property is sold. The average annual effective rent divided by the square footage. If there is free rent given, the time period of free rent should be included in the calculation. Amount of money paid to the Landlord, usually quoted on an annual basis per foot or monthly amount. For industrial warehouse property, it is often quoted as Monthly. It typically does not include rental tax, but may include all other charges for expenses related to the building operation (electricity, water, insurance, janitorial, repair). When the expenses are included in the base rent, this is commonly called a full service lease. See Overages and Escalation terms. Actual taxes and operating expenses for a specified base year, most often the year in which the lease commences. Most full service leases require tenant to pay for any increases in expenses above the base year. The construction or improvements of the interior of a space, including flooring, walls, plumbing, and electrical work. Built-in cabinets and millwork are considered part of build-out, but not furniture typically. An open area in the office portion of the space, typically where modular furniture is placed. A Licensed Real Estate Agent working solely for the Buyer, not the Seller. Agency rules in Arizona allow the Buyer’s Agent to receive a commission from the Seller even though he does not represent the Seller. Most Sellers have their own Sellers agents working to get them the best price and terms. The parties to the transaction must be informed ahead of the negotiations of this status. The Buyers Representative (agent) is normally paid by splitting the commission already agreed to be paid by Seller to the Sellers agent. A provision in a lease that gives the ability of a party to the lease to terminate the party's obligations. The grounds and ability to cancel are usually specified in the lease. Sometimes a penalty is assessed by the landlord, equal to a few month’s rent and recapture of unamortized tenant improvement costs. A percentage that relates the value of an income-producing property to its future income, expressed as net operating income divided by purchase price. These are classifications trying to measure the quality of the building. Usually, it is based on rental rates with the presumption that price reflects the image and appeal a property has. This classifying term is challenging, as each of us perceives quality differently. It should not be relied upon as a judgement of the property, merely more a gauge of where the asking rent level is in comparison to other property. A date which Landlord and Tenant agree the lease actually started. This may be different than the occupancy or lease date. Often, a lease document has a commencement date exhibit that both parties sign. The commencement date often triggers the start of rent and acceptance of the property condition. For lease purposes, the areas of a building that are available for the nonexclusive use of all its tenants, such as lobbies, corridors, janitor closets, and stairwells. Multi-tenant multi story buildings with common lobbies will average around 10% of its size in Common Area. This is the amount of additional rent charged to the tenant, on top of the base rent, to maintain the common areas of the property shared by the tenants and from which all tenants benefit. Examples include landscaping, parking lot sweeping, building insurance, property security, property taxes. More often, this does not include any capital improvements that are made to the property. For industrial and warehouse properties the Tenants may share a truckwell, typically located in the overall parking area or alongside the side of the building. This limits overnight dock parking of trucks but is efficient for less active in-out sporadic deliveries. Multiple suites or spaces within the same building and on the same floor which can be combined and rented to a single tenant. Tenants will often be granted first rights of refusal on contiguous space to their suite. The partition wall that separates one tenant’s space from another or from the building’s common area such as a public corridor. Refers to a Licensed Real Estate Agent who claims to be representing the best interests of both the Tenant and Landlord, or both the Buyer and Seller. This is sometimes referred to as Limited Dual Agency. Wording in a lease document that allows a Tenant to end their lease obligation earlier than the original term. Used for rapidly expanding companies, or startups that may be at risk for success. Usually, there are associated written notices required and payments of additional fees to the Landlord. A document signed by the Tenant that confirms they are the Tenant, that their lease is legitimate, and the amount of any security deposit the Landlord is holding. It is usually required to be signed by the Tenant when an owner sells the property, or is refinancing their debt on the property. A system for cooling space, usually warehouse areas, that injects water onto a filter and then blows air across the filter. In Arizona, this will bring the temperature down in the summer while costing about half as much as traditional air conditioning. Humidity levels created with this system are far less than a typical southeast U.S. summer day and do not affect most products. Evap systems provide no winter warmth. Refers to how much a Tenants rent or obligation for expenses will increase. Usually quoted as a rate per foot per year, or as an annual percentage. Some are tied to the Consumer Price Index (CPI). Others are just negotiated up front. Not all leases have these. An office within an office. Usually less than 200 square feet. In addition to the space, the tenant may receive secretarial-receptionists services, copies, fax, and phone. The price is usually 3 to 5 times typical space. Great option for one or two man shows or startups. Lease terms may be as short as six months. A dollar amount (usually stated as an amount per foot per year) that the Landlord agrees to pay for building expenses. If expenses of the building exceed this amount, then the Tenant pays the amount above the expense stop based on their square footage of the building. Space that is flexible in terms of what it can be used for (e.g., space that could be utilized for industrial or office activities). Often they will be office in front and warehouse in back. A term used to describe a lease in which the stated rent amount being paid to the Landlord includes all the expenses of the building (electricity, water, gas, janitorial, RE taxes, insurance, etc.). Usually the tenant may have to pay for the overages (see term) that occur as years unfold. A lease of property where the landlord pays for all property charges usually included in ownership. These charges include utilities, taxes, and maintenance. The term Full Service lease is more commonly used in Arizona. Signer (guarantor) assures Landlord that Tenant signing the lease will pay the rent. If not, the signer (guarantor) will be obligated to fulfill the lease. Used when the Tenant may be financially weak, or substantial tenant improvement work is requested by the Tenant. Guarantor can be a corporation or a person. See personal guarantee. A situation whereby a tenant is still occupying the space after their lease has expired. It can occur with or without the landlords consent. Often, hold over periods are pre-stated in the lease, and the tenant will incur a rent increase (i.e. 125% of current rate) until they vacate or renegotiate the lease. It causes the Tenant to agree on renewing or vacate as the cost of making no decision could be excessive. A contract that creates the relationship of landlord and tenant. A contractually binding agreement that grants a right to exclusive possession or use of property in return for a periodic payment called rent. A document that outlines the general terms of a proposed lease or purchase. Commonly called the LOI. It becomes the basis from which a formal lease or purchase document is written. These may or may not be binding between the parties, depending on language used. A more thorough Letter of Intent provides the parties with a more clear understanding of what they will agree to in the formal lease or purchase contract. That portion of the building which is shared by all tenants (i.e. restrooms, enclosed stairwells) or is within the physical structure (i.e. columns) but can't be accessed by Tenants. Typical load factors are 6% to 13%. If a space is 1,000 square feet with a 13% load factor, it means the building is only 87% efficient. In real terms, that means a 1,000 rentable square feet with zero load factor is 13% cheaper than the 13% load factored 1,000 rentable square foot space. 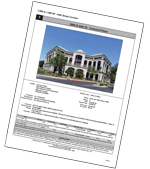 Contrasted with a full service lease, a modified gross lease has the tenant paying directly some of the expenses. Typically, it is where the janitorial, electric and water are separately metered and the tenant pays directly to utility. In comparing lease rates, make sure you consider who is responsible to pay for what. This adds about $3 per foot per year to a base rent. For warehouse property it is sometimes referred to as IG (industrial gross). Signage that is normally not attached to the building. Often located at best street exposure for Tenant Identification. Some Landlords charge for placement on a monument sign. A dollar amount paid by the owner to cover, in part or in whole, tenant moving expenses. The tenant signed document to prevent tenant from being evicted if the property owner does not pay its mortgage to the bank. It should be included language in the lease. A lease arrangement whereby the Tenant is obligated to pay for all the operating expenses associated with their space. They would have to contract individually for janitorial, electricity, insurance, and repairs. Not often seen in office buildings because many services overlap (i.e. there is a central air system, central restrooms). In a typical building these costs add about $6 to $7 per foot per year to the base rent. Expenses related to the building and property. Typically includes electricity, water, gas, janitorial, parking lot sweeping, landscape maintenance, building maintenance (except major renovations), real estate taxes, insurance, and management fees. These items should be detailed in the lease document in order to avoid confusion. The right of a tenant to extend their occupancy beyond the original term. The rental rate may or may not be pre-set. Can be useful for a Tenant so they are not forced to re-locate. This term refers to the increase in the cost to operate the property from one year over the last. If it cost $6 per foot per year (for electric, water, janitor, taxes, etc) last year, and $6.40 per foot this year, then the overages are $.40 per foot per year. The tenant would be responsible to pay this overage to the Landlord, calculated on the size of the space they have. A licensed Real Estate agent working to get the best deal for the Owner or Landlord. Frequently referred to as the Listing Agent. Refers to expenses that are incurred on the property that are passed from the Landlord to the tenant. Both Tenant and Landlord should have a lease that is clear on who pays what, when. Not often used in office properties, but more typically in retail properties. This is rent above the base rent and building operating expenses. Often it is based on business sales volume conducted in the rented space. A paragraph in a lease which describes how the Tenant may use the space i.e. administrative office. Becomes important if zoning is in question or if Tenant plans unique purpose, or if a sublease is pursued. A document which becomes part of the lease transaction signed by a party assuring the Landlord the performance and payment of rent if the Tenant defaults. Typically this allows the Landlord to pursue payment of rent from the principals who signed the guarantee, in the event the Tenant (often an LLC) defaults. Guarantee documents may allow Landlords to pursue the principals for payment even without pursuing the defaulted Tenant. An amount calculated by dividing the square foot of the Tenants space by the entire building size. A 1,000 sqft Tenant would have a 10% pro-rata share of a 10,000 sqft building. Attention should be paid to variances in occupancy levels, particularly as it relates to expense overages. Rentable building area. The total size of the building. An amount charged by the County and City that is against the rental income the Landlord receives from the Tenant. Depending on the City, it varies from 1.4% of the rent, to close to 3%. It's usually paid on-top of the base rent amount. Spaces identified for a specific purpose, which typically excludes visitors. Important to consider how much of the entire parking is established as reserved versus open (i.e. for visitors). Reserved usually means the Tenant is paying for it, whether per space or as part of the lease. The reserved spaces are normally covered, but may be uncovered in hi-rise or densely parked projects. Refers to the square footage that is used in calculating rent. The rentable square footage normally exceeds the usable square footage because the Landlords allocate the areas that all the tenants have in common (i.e. Elevators, central lobbies, columns, restrooms, storage closets). BOMA (Building Owners and Managers Association) is a national group that provides a written formula for measuring standards. The difference between the rentable and the useable is called the load factor. Useable plus load factor equals rentable. The process of leasing space from a Tenant who is already obligated to a Landlord. A tool used to relieve a current tenant from the space. Does not normally release the primary tenant or their guarantors from the original lease. Most leases require Landlords consent. Subtenants need to confirm all aspects of the lease in writing with both the original Tenant and the Landlord to make them attractive, most subleases are done at a discount from the face rate on the lease and the original primary Tenant absorbs the difference. Money collected at initiation of lease to provide additional confidence the Tenant will perform. It is not normally the last month’s rent, but is typically equal to that amount. Also, most leases require the deposit be replaced if the Landlord has to use it to cure a monetary default. It should be clear in the lease document as to the space condition needed and timing at end of lease for return of deposit. The interior condition of the tenant's space when it is without improvements or finishes. Shell construction typically includes the floor, windows, walls and roof of the suite and may include some HVAC, electrical or plumbing improvements but not demising walls or interior space partitioning. A graphic representation of a tenant’s space requirements, showing wall and door locations, room sizes, and sometimes includes furniture layouts. Refers to physical work done to a space to accommodate a specific tenants needs. Can include many things, such as carpet, paint, new wall partitions, new sinks. Depending on negotiations, most Landlords allocate money to pay for certain standard items. Unusual items may have to be paid by the Tenant, or amortized over the lease term as additional rent. A full remodel could run between $30 and $50 per foot, depending on condition of space prior to changes. specified amount of money the owner will pay for tenant improvement. Amount above Owners allowance may be paid by tenant as lump sum or may also be amortized over the lease. A Licensed Real Estate Agent working for the best interests of the Tenant, not the Landlord. They usually don't have a listing agreement or agency relationship with the Owner or his Agent. This allows the Tenant Rep. to commit fully to achieving the objectives of the Tenant. A lease arrangement whereby the Tenant is obligated to pay for all the operating expenses associated with their space. They would have to contract individually for janitorial, electricity, insurance, and repairs. Not often seen in office buildings because many services overlap (i.e. there is a central air system, central restrooms). NNN leases can become expensive if surprise maintenance issues arise, or the property does not have an established expense pattern (it's new). The square footage that the individual tenant can actually use to sit or work in (see rentable square footage and load factor). Most leases use the phrase...Rentable Square Footage, as it may cover up variations in individual suites and makes the rent seem cheaper per foot. The percentage of the total supply of space of a specific commercial type that is vacant and available for occupancy at a particular point in time within a given market. It may include sublease space. Many published studies only include buildings over 10,000 square feet in their measurements. Description of construction and the amount of money a landlord agrees to spend on the construction of the interior of a space per the lease, usually negotiable. The set of plans for a building or space that indicate the precise manner in which a project is to be built. This set of plans includes a set of detailed specifications for the building or space.